This resource provides a multimedia introduction to nanoscience, the interdisciplinary study of special phenomena that occur when objects are of a size between 1 and 100 nanometers. The unit features activities for exploring scale and unusual properties at the nanoscale, lessons about the tools of nanotechnology such as the scanning probe microscope, and example applications. Supplementary materials include a classroom play about a not-too-futuristic world where every aspect of daily life is influenced by nanotechnology. This curricular unit aims to model the process scientists use when confronted with new phenomena. It provides meaningful practice in constructing scientific questions and explanations, two of the Scientific Practices addressed in the NextGen Science Standards. These materials were developed in a modular fashion to enable use for a short classroom introduction or a two-week experiential learning project. 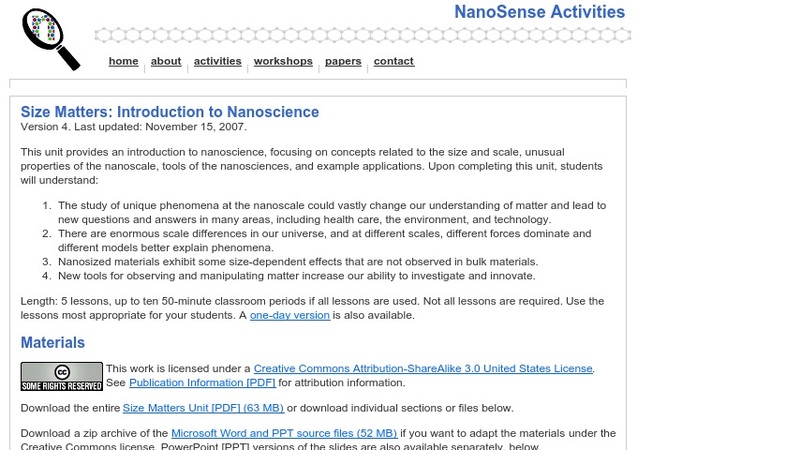 NanoSense is NSF-funded project to aimed at promoting the teaching of nanoscale science at the high school level.